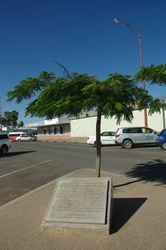 A plaque commemorates Charles Kingsford-Smith who set up a business in Carnarvon. In 1924, fresh from a stint as a pilot for Australia`s first commercial airline, Sir Charles Kingsford-Smith and Keith Anderson bought a truck and set up business as the Gascoyne Transport Company. 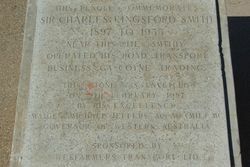 Kingsford-Smith figured that with his mechanical knowledge and the new-fangled technology of motorised transport he would out-do the camel trains and horse wagons on many inland delivery routes. He also thought that if he was right the money he would make would finance his dream - to be the first to fly the Pacific. 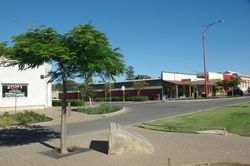 One of his contracts was the mail run from Carnarvon to the Bangemall goldfields near Mt Augustus.